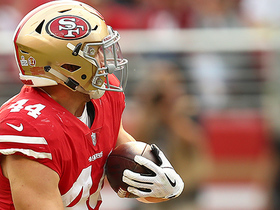 The 49ers exercised Juszczyk's contract option for 2019, Adam Caplan of SiriusXM Radio reports. Analysis: Juszczyk will receive $4.2 million for the 2019 season after catching 30 passes for 324 yards and one touchdown last season. The 27-year-old also rushed eight times for 30 yards, with most of his involvement in the run game coming as a blocker. Juszczyk ran the ball twice for nine yards and caught one of two targets for 15 yards in Sunday's 48-32 loss to the Rams. Juszczyk brought in his lone target for three yards in Sunday's 26-23 win over Seattle. Analysis: Juszczyk returned to a season-low one target after seeing six over his previous two contests. It has become apparent that head coach Kyle Shanahan doesn't view his fullback as an offensive option with Nick Mullens under center, preferring to use his blocking skills as opposed to deploying him as a weapon out of the backfield. Juszczyk would need a heavy target share to generate value at an unfavorable fantasy position, and that simply isn't the case in the team's current scheme. Juszczyk caught all three of his targets for 20 yards in Sunday's 43-16 loss to the Seahawks. Analysis: Juszczyk did not record a touch in last week's loss to Tampa Bay, so Sunday's showing was a step in the right direction. Still, the 27-year-old hasn't posted a noteworthy performance since accruing 87 yards back in Week 5, and his status as a fullback sours any potential as a PPR option for Sunday's matchup with the Broncos. Juszczyk did not receive a touch in Sunday's 27-9 loss to Tampa Bay. 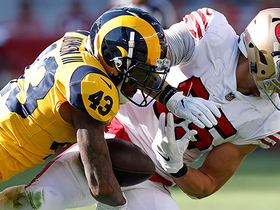 Analysis: Juszczyk was a regular part of the passing game earlier this season (23 catches for 265 yards and a touchdown), but he has seen his role diminish in the three games Nick Mullens has started at quarterback (just six touches over that span). With his new quarterback favoring other passing options, Juice's fantasy value has been drained completely. Juszczyk had a 3-yard carry and added 10 yards on two catches during Monday's 27-23 loss to the Giants. Analysis: This marks four straight weeks without at least 15 total yards for Juszczyk, who was performing beyond that of the average fullback to start the season with a few long receptions and even a touchdown in Week 3. 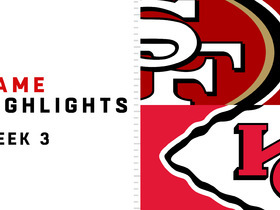 Those times appear to be over for a banged-up 49ers offense. Following their Week 11 bye, the 49ers get a bottom-five pass defense in Tampa Bay, but Juszczyk hasn't been targeted enough lately for him to be counted on to exploit the favorable matchup. Juszczyk gained a yard on one carry and caught both of his targets for 10 yards in Thursday's 34-3 win over Oakland. Analysis: Juszczyk failed to haul in a pass for the first time all season last week against the Cardinals, but he got back in the receiving column Thursday. Despite his regular involvement in the passing game, the fullback's production has tailed off after he flashed some big-play ability earlier in the campaign. That leaves him off the radar in all but the deepest of fantasy leagues heading into the Week 10 matchup with the Giants. Juszczyk was targeted once during Sunday's 18-15 loss to Arizona but was unable to come down with the catch. He gained 10 yards on two carries. Analysis: Juszczyk had a big 87-yard day against Arizona in Week 5 but was unable to come close to that Sunday. The fullback did have his first multiple-carry game of the season but recorded 30 or fewer yards for the third straight week. He remains a sometimes-viable receiver out of the backfield, but his production doesn't happen often enough to make him worth playing Thursday, even against a middle-of-the-road Oakland pass defense, which is surrendering 270 receiving yards per game. Juszczyk finished with one carry for minus-five yards and caught two of three passes for 18 yards in Sunday's 39-10 loss to the Rams. Analysis: With at least two targets in every game this season, Juszczyk touches the ball more frequently than most fullbacks around the league, but his fantasy upside remains fairly low outside of deep PPR formats. He's only surpassed 50 receiving yards in two of the 49ers' seven games and has found the end zone just once. Juszczyk caught all three of his targets for 30 yards in Monday's loss to Green Bay. Analysis: Juszczyk was unable to match last week's season high of 75 yards, but his three receptions ranked fourth among all San Francisco receiving options Monday. The 27-year-old is averaging 2.8 receptions and 37.8 yards per game this season. Those numbers are exceptional for a fullback, but lacking in terms of a standard-league running back when you factor in the lack of carries (just one carry through six weeks). Juszczyk carried the ball once for 12 yards and hauled in six of seven targets for 75 yards against the Cardinals on Sunday. Analysis: Juszczyk's carries, receptions and total yardage all were season highs. The fullback's uptick in production was due in large part to a game script which saw the 49ers run 88 offensive plays. While "Juice" is unlikely to see this sort of usage on a weekly basis, he is clearly a part of the team's passing gameplan with 14 receptions, 197 yards and a touchdown through five games. Juszczyk caught two of three targets for 15 yards during Sunday's 29-27 loss to the Chargers. Analysis: Juszczyk has been consistent this season, averaging two catches per game and, in theory, should serve as a security blanket for new quarterback C.J. Beathard. Juszczyk can get downfield and score more so than your average fullback, but that isn't enough to warrant much fantasy attention. Thing should get tougher against Arizona's top-10 pass defense in Week 5. Juszczyk hauled in two passes (four targets) for 38 yards and a touchdown in a 38-27 loss to the Chiefs on Sunday. Analysis: The majority of Juszczyk's production came on a well-executed play-action fake that allowed the fullback to end up wide open for a 35-yard score. The 27-year-old has yet to log a carry this year, but he is proving to be a sneaky weapon in the passing game with 107 yards on six receptions (10 targets). Juszczyk caught three of four targets for 13 yards during Sunday's 30-27 win over Detroit. Analysis: The 49ers have been balanced distributing the football through two weeks -- George Kittle leads the squad with 13 targets -- but five others, including Juszczyk, have at least six. That's good exposure for fullback, but even with that level of involvement, he probably doesn't have enough opportunities to be a week-to-week factor. He has topped 60 total yards in a game just twice in his career -- both in 2017. Juszczyk only caught one pass Sunday, but it went for 56 yards in a loss to Minnesota. He did not receive a carry. Analysis: Juice put his route-running and receiving skills on display, running a crisp wheel route out of the backfield and bringing in a sideline bomb from Jimmy Garoppolo for a huge gain. The 27-year-old has a strong chance of leading all fullbacks in receiving for the second-consecutive season, but his lack of touches and unfavorable eligibility at running back should keep him out of the fantasy picture. Juszczyk played 53 percent of offensive snaps in the five games Jimmy Garoppolo started last year, Sports Illustrated's Andy Benoit reports. Juszczyk finished the 2017 campaign with 31 yards on seven carries and 315 receiving yards and a touchdown on 33 receptions through 14 games. Juszczyk hauled in all five of his targets for a career-high 76 yards in Sunday's 44-33 win over the Jaguars. Analysis: It didn't take long for the receiving fullback to break his previous career high that he set two weeks ago. The 26-year-old has seen his role expand over the past three weeks, garnering 14 targets and producing 156 receiving yards over that span. While those numbers resemble that of a potentially-rosterable tight end, Juszczyk is considered a running back, which severely limits his fantasy value due to his very-low floor. Juszczyk hauled in three of four targets for 64 yards in Sunday's 26-16 victory over the Texans. Analysis: It was the versatile fullback's best yardage output of the season. Juszczyk has been seeing a small uptick in targets recently, hauling in 13 catches over the past four weeks. On the flip side, he has been completely absent from the running game, failing to receive more than one carry in any game this year. 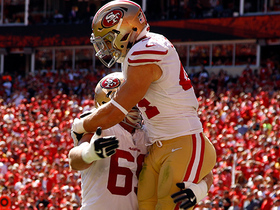 While his versatile production as a fullback is useful for the 49ers, it would take a unique fantasy format to render Juszczyk a viable option. Juszczyk caught two passes for eight yards during Sunday's 24-13 loss to Seattle. Analysis: San Francisco continues to show faith in Juszczyk despite entering Sunday back-to-back weeks with fumbles. The fifth-year fullback gets more action than most players at his position, but is limited somewhat in how productive he can be with just one touchdown for a 49ers offense ranked in the bottom five in the league in offense. 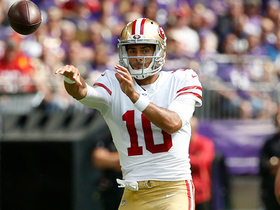 As is the case with all of San Francisco's skill players, it will be worth watching to see what kind of effect Jimmy Garoppolo might have on the 49ers' fortunes. Juszczyk (neck) caught five passes (six targets) for 27 yards and ran the ball once for no gain in Sunday's win over the Giants. Analysis: Juszczyk was heavily involved in the passing game, pacing the team with five receptions and tying Garrett Celek for the team lead with six targets. He didn't do much with his dump-off passes, but the athletic fullback remains one of the most-utilized pass catchers at his position, leading all fullbacks with 20 targets this season. 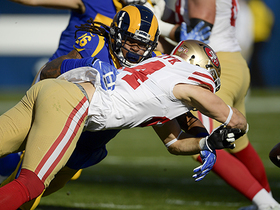 Juszcyk (neck) is free from the 49ers' injury report heading into Week 10. Analysis: Following a few limited sessions earlier in the week, Juszczyk logged a full practice Friday and appears on track for Sunday's matchup with the Giants assuming he avoids any setbacks. 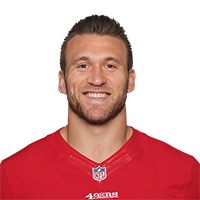 Juszczyk is out for the remainder of Sunday's contest against the Cardinals after suffering a neck injury, Matt Maiocco of NBC Sports Bay Area reports. Analysis: Juszczyk will finish the game with one carry for five yards, one catch for one yard and a costly fumble to his name. Given the 49ers current record, it wouldn't be surprising to see Juszczyk's injury handled conservatively, especially given the oftentimes serious nature of neck injuries. The San Francisco 49ers convert on a third-and-long tunnel screen to their fullback Kyle Juszczyk for 17 yards on a pass from quarterback Nick Mullens. 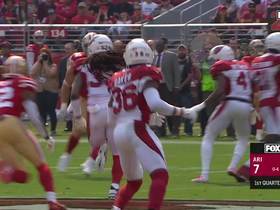 Arizona Cardinals defensive tackle Robert Nkemdiche tips pass from San Francisco 49ers quarterback C.J. Beathard and nearly comes away with an interception. Los Angeles Rams safety John Johnson rips the ball from San Francisco 49ers tight end George Kittle to intercept quarterback C.J. Beathard. 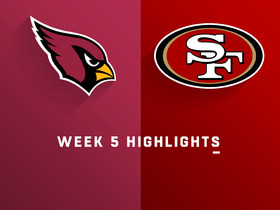 Watch the highlights as the Arizona Cardinals take on the San Francisco 49ers in Week 5. 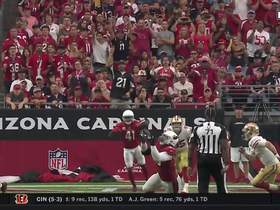 Arizona Cardinals safety Tre Boston gets an interception off of San Francisco 49ers quarterback C.J. Beathard. 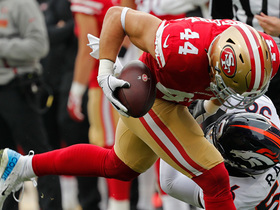 San Francisco 49ers fullback Kyle Juszczyk uses his speed to run pass defenders on a 25-yard drive. San Francisco 49ers QB Jimmy Garoppolo finds full back Kyle Juszczyk for a 56-yard catch and run.